Background: Anastomotic and staple line (ASL) leaks occur after laparoscopic Roux en Y gastric bypass (LRYGB) with a reported incidence as high as 6%. Leaks are the second most common cause of mortality, after pulmonary embolism, and can be associated with significant morbidity. Therefore, prevention and early detection are essential in limiting both morbidity and mortality. This report describes our technique for preventing leaks after LRYGB. Method: A retrospective analysis of prospectively collected data was performed on all LRYGB surgeries performed in a community hospital, by three surgeons, from August 2001 to December 2005. All operations were performed using the same operative technique including the use of staples with buttressing materials, hand-sewn otomy closures, stay sutures, intra-operative leak testing, and fibrin sealant. Results: From August 2001 to December 2005, 760 patients underwent LRYGB. Of these, 88.7% (n=674) were women and 11.3% (n=86) were men. The mean BMI was 49.7 kg/m2 (range: 36-83 kg/m2). The patients’ mean age was 40.1 years (range 17-72 years). 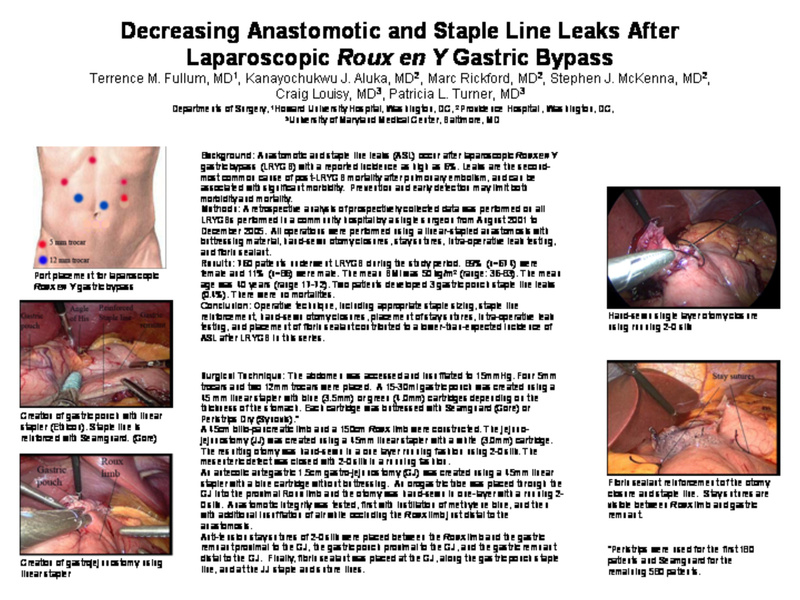 Two of the 760 patients developed 3 postoperative gastric staple line leaks (0.39%). Our mortality rate was zero. Conclusion: The technique described herein resulted in a leak rate that was substantially low compared to what was published in the literature.